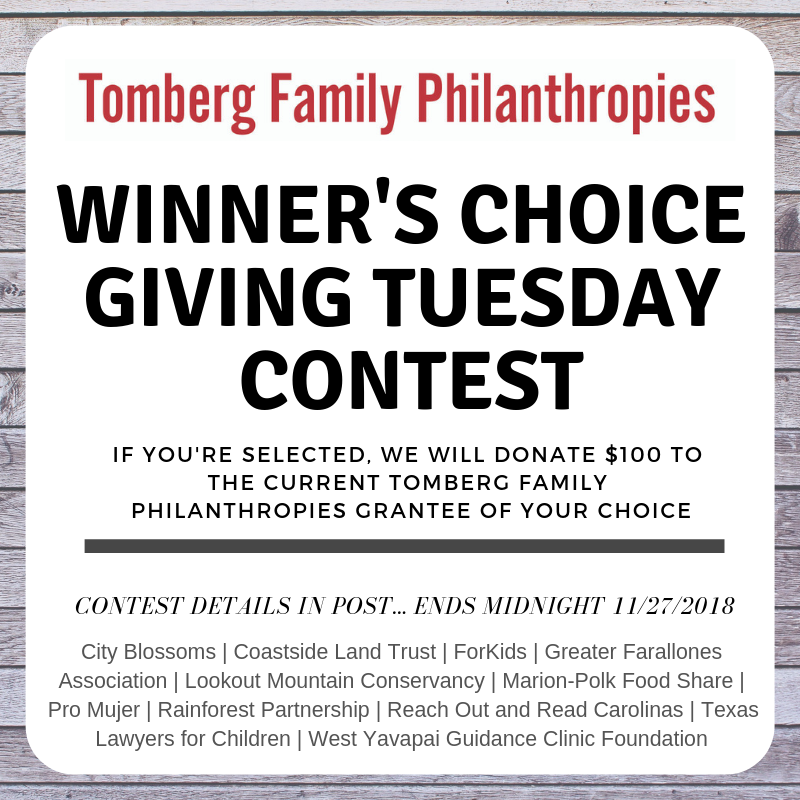 The Tomberg Family Philanthropies is having a a Giving Tuesday contest – with a twist! Let us know what philanthropy means to you. If you’re selected, we will donate $100 to the current Tomberg Family Philanthropies grantee of your choice! – Starting now and ending midnight PST on Giving Tuesday, November 27, 2018, explain “What does philanthropy mean to you?” in 100 words or less in a post on your Facebook profile. – Like the Tomberg Family Philanthropies Facebook page, https://www.facebook.com/TombergPhilanthropies . – Tag Tomberg Family Philanthropies in the Facebook post so we can read your contest entry. – Our Advisory Board will choose the response we find most inspirational and announce the winner on our page shortly after Giving Tuesday. These are the current grantees you can choose to donate to: City Blossoms, Coastside Land Trust, ForKids, Greater Farallones Association, Lookout Mountain Conservancy, Marion-Polk Food Share, Pro Mujer International, Rainforest Partnership, Reach Out and Read Carolinas, Texas Lawyers for Children, and West Yavapai Guidance Clinic Foundation. The best part about this contest? Anyone can participate! Please share this widely within your networks, the more people that respond who support a specific organization, the more likely it will receive the $100 donation!